The black RoadTrip Classic Leather Edition Tripod from MeFOTO is a 3.7 lb support with aluminum legs that reverse-fold to become a compact 15.4" for transport. With the legs in a normal position you can turn the twist-locks, extend the center column and each of the 5-leg sections, so the tripod can reach a maximum height of 61.8". Moreover, each leg has a double stitched Italian leather hand grip, which makes it comfortable to hold and adds a level of protection to the legs. The Arca-type compatible Q1 triple-action ball head is capable of handling mirrorless to large DSLR cameras with its load capacity of 17.6 lb. Furthermore, the head has an independent pan lock, a control knob to lock the ball, and a friction control knob to increase or decrease drag to the ball. 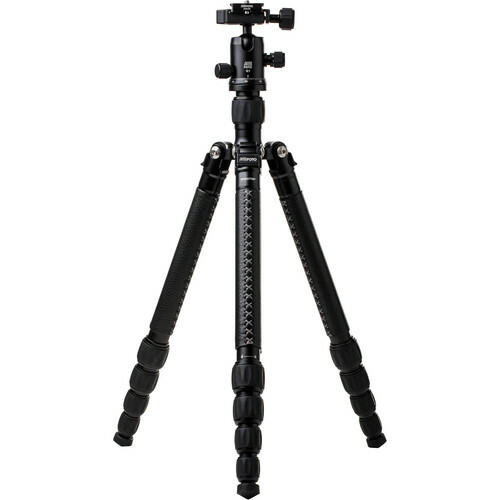 One of the tripod's legs is removable and it combines with the center column to create a full-sized monopod with an adjustable height between 53.1 and 64". Additionally, included in the bag are a set of spiked feet.